A man goes to the doctor complaining that his arm is hurting. "I'm afraid that you're dying and don't have much time left", said the doctor. 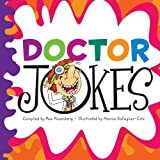 "Doctor when I wake up in the morning I feel faint, and it lasts for up to an hour"
Hilarious joke book full of wonderfully silly new doctor jokes, classic doctor jokes, that will have the whole family laughing! Fully illustrated with super funny cartoons and fun activities! If you’re looking for a good quality book that children and parents will enjoy, this book will not disappoint!